In the spirit of all things fall and pumpkin spice, I’m linking up with a ton of fabulous bloggers to share with you some of our fall favorites! Plus, you can grab some FREEBIES and find some giveaways along the way! One of my all time favorite things to teach this time of year is PUMPKINS! I like to start out by reading a few books about the life cycle of a pumpkin. 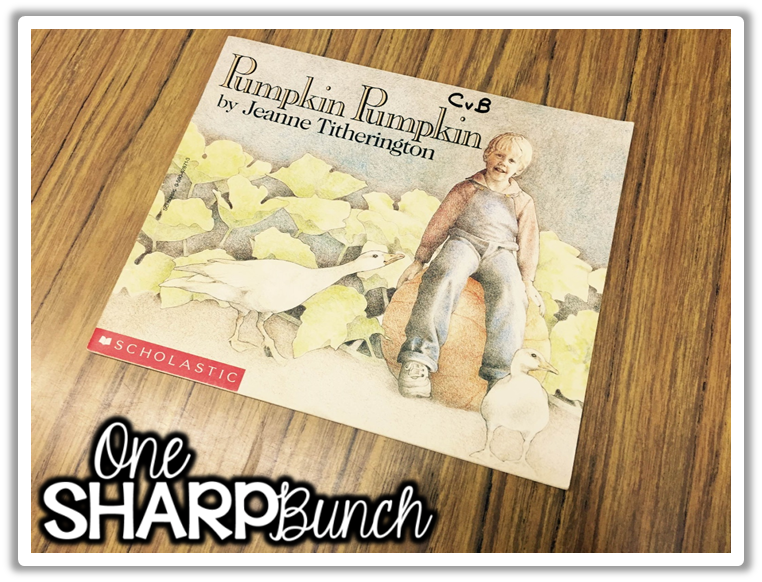 Pumpkin Pumpkin by Jeanne Titherington is one of my favorites! First, we read the entire story. Then, I reread and stopped after each page to add a piece to our life cycle anchor chart. This book lends itself perfectly to creating this anchor chart! 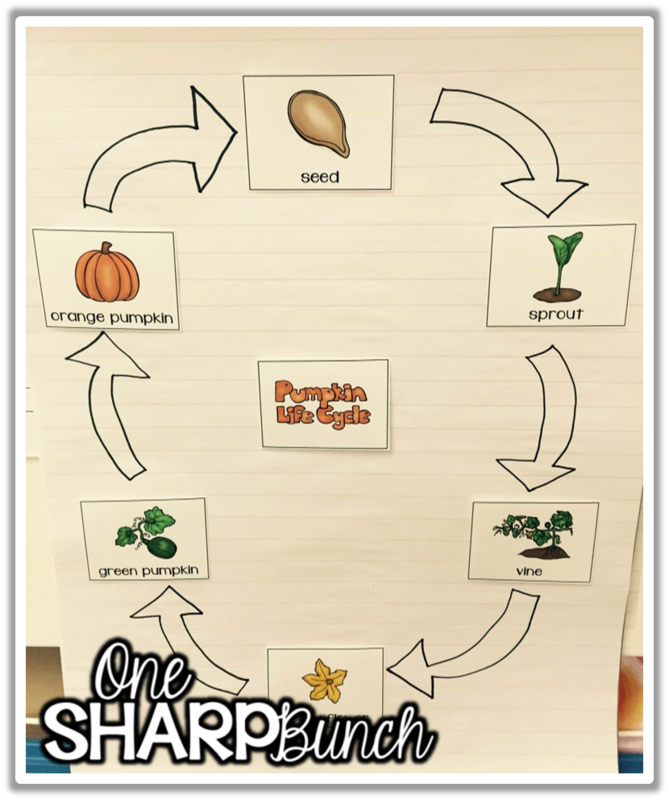 As the week progressed, I continued to read other books about the life cycle of a pumpkin. The kiddos went crazy over this flip flap book! Once we were finished sequencing the life cycle, we practiced telling our “elbow buddies” all about the life cycle. I was so impressed with all the vocabulary they had learned! Speaking of vocabulary… we also read these emergent readers, practiced tracking print 1:1, used the illustrations to help determine unknown words, and completed the interactive last page using describing words. On the last day of pumpkin week, we completed our pumpkin investigations! OMGoodness! Y’all, the kiddos were so engaged! I kept calling them scientists and mathematicians! I set the pumpkin investigations up as stations, with a pumpkin at each. 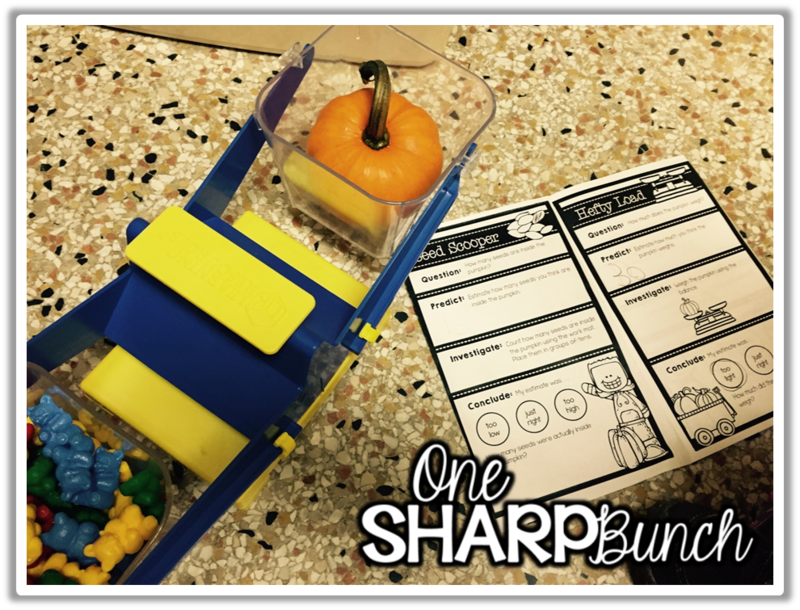 The first station completed the “Seed Scooper” activity by estimating how many seeds were inside the pumpkin. Then, they used the “Seed Scooper” counting mats to count the seeds. Our pumpkin had over 600 seeds! My estimate was only 200… I guess I need better estimation skills! As this group was working on counting seeds, one of the other stations was working on weighing a mini pumpkin. Can you believe the mini pumpkin weighed 70 teddy bears?!?! My kiddos were sure impressed! Of course, the day wouldn’t be complete without feeling the gooey inside of a pumpkin! Then, we made our own little “What’s Inside a Pumpkin?” craftivity. The kiddos had such a ball! One boy told me it was the best day ever! He was the same boy that told me he didn’t want to go to recess because he wanted to start the pumpkin investigations right away! Music to my ears! 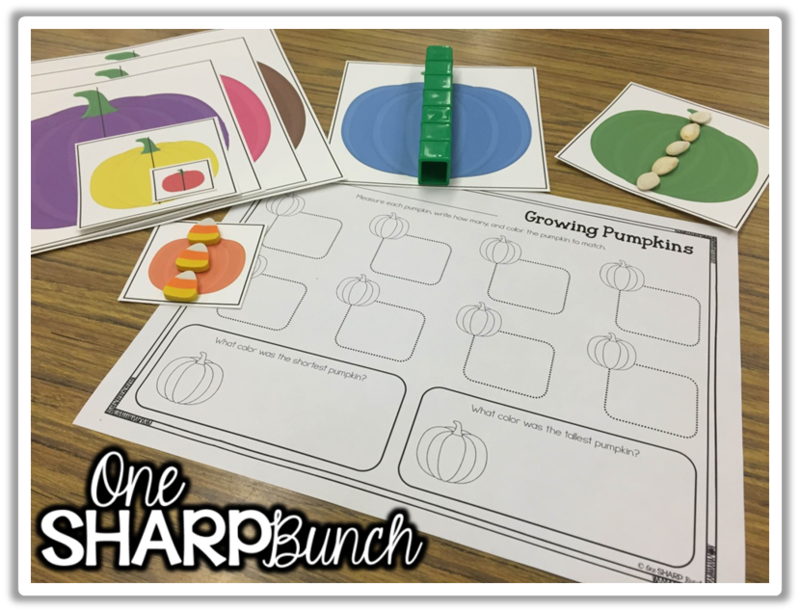 Growing Pumpkins: This activity can be used with any nonstandard unit of measure. These are just a few ideas: candy corn erasers, linking cubes, and pumpkin seeds. 1, 2, 3 Count on with Me: The students rolled a multiple sided die, wrote the number, and then counted on from that number. 10 Perfect Pumpkins: In this center, we practiced making 10, as well as our fine motor skills. 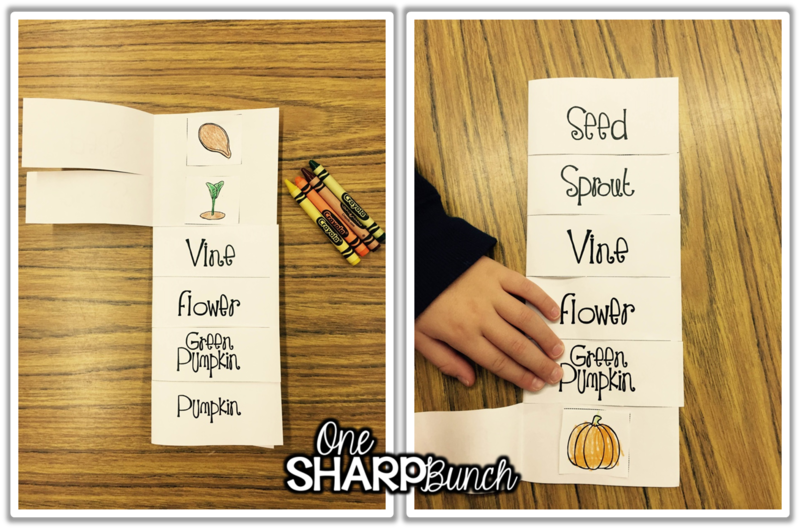 So Many Seeds: The students worked on subitizing with ten frames with this count the room activity. 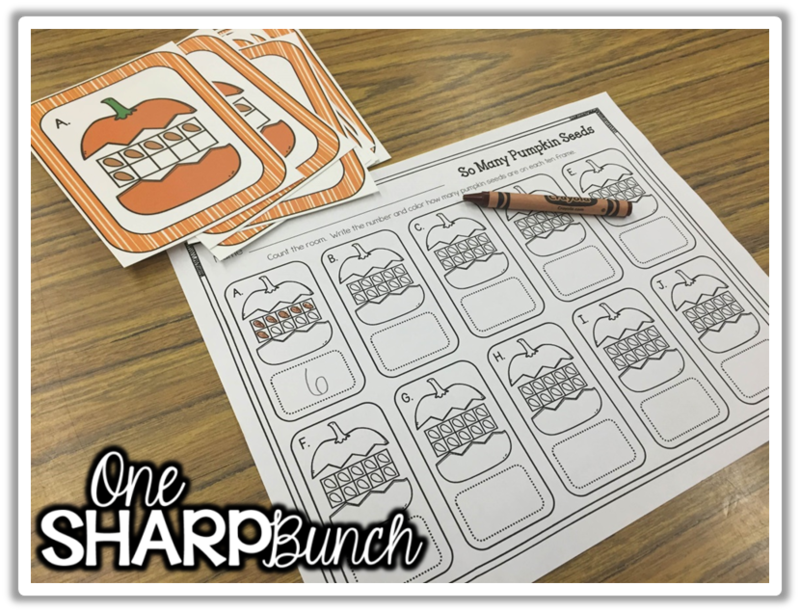 Pumpkins are one of my favorite topics to teach because it can easily be taught in October or November. Some years, I teach about pumpkins before Halloween, and other years before Thanksgiving. These activities would also be perfect to use on Halloween day, especially if your school does not celebrate this holiday. This pack, as well as a few other of my fall favorites are on sale in my TpT store this weekend! and my I Can Read October Poetry Binder here! 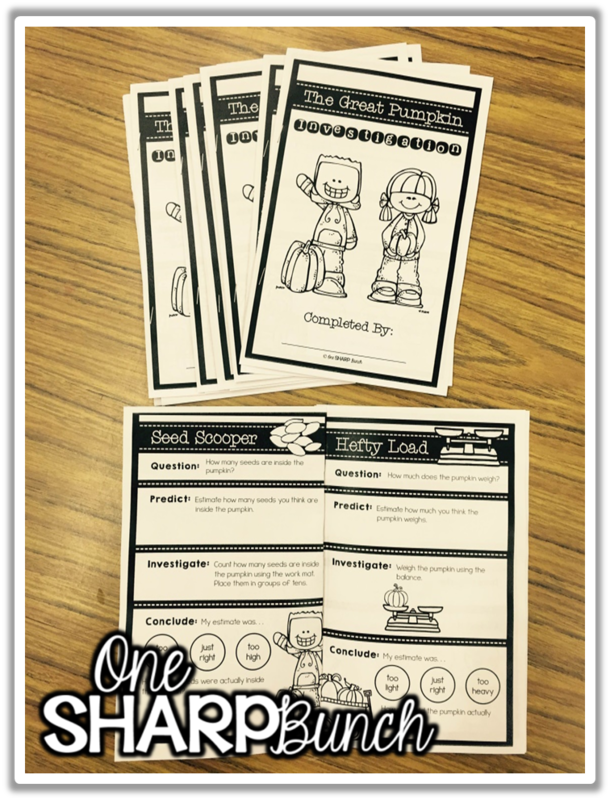 And because my kiddos loved learning about pumpkins so much, I have a pumpkin FREEBIE for all of you! Thanks for dropping by to check out all my fall favorites! 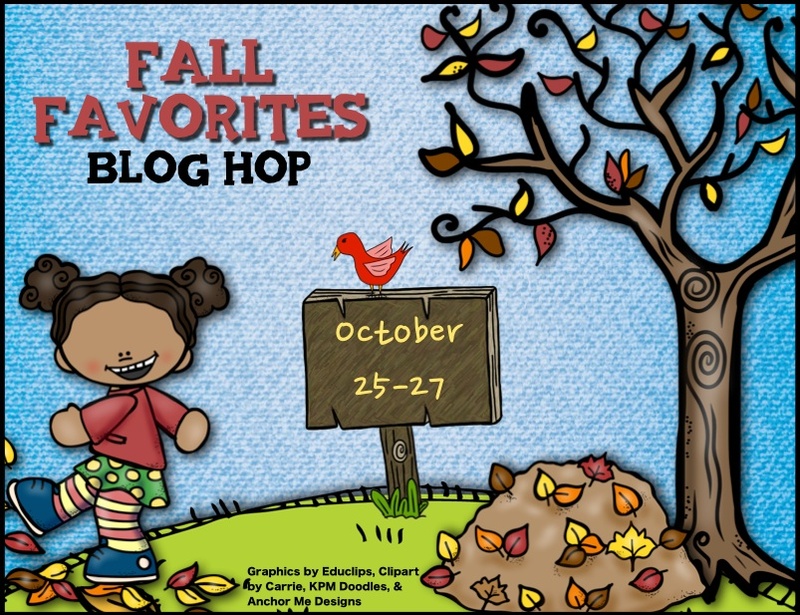 Now, hop on over to The Research Based Classroom for more fall fun! I absolutely love all of these activities. Thank you! Oh my goodness! I love these pumpkin ideas! Thanks for sharing! Ashley ~ GREAT activities! 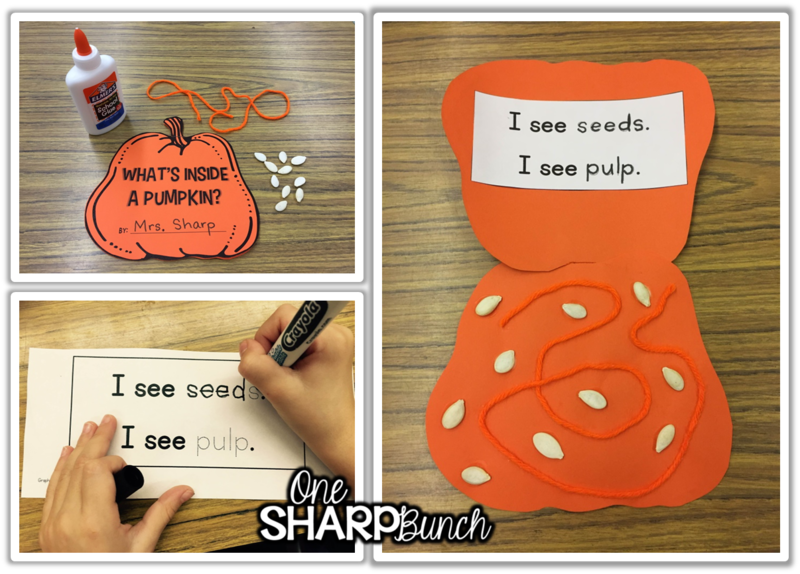 I use to do this with my class many years ago.. your blog post has inspired me to do my Pumpkin Unit again! 🙂 Thanks for sharing!! Fun activities! 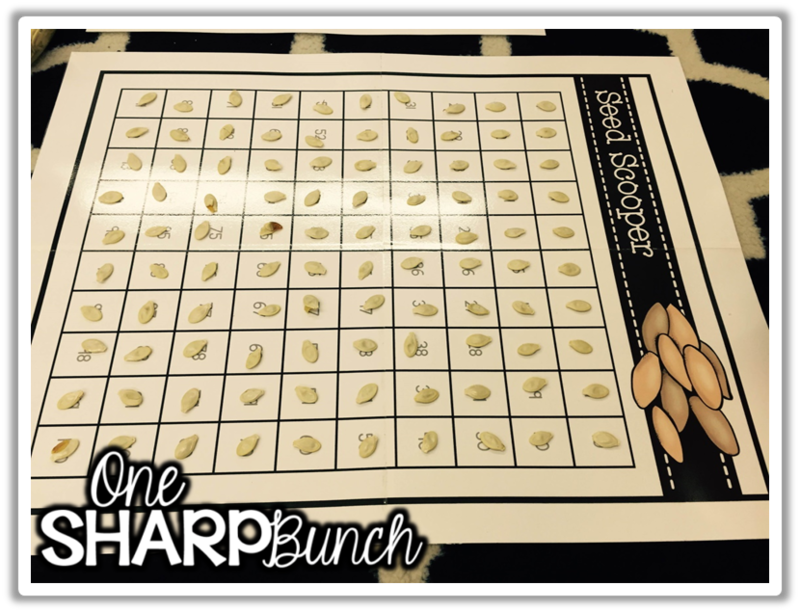 Loved the idea of using a hundreds chart to count the seeds. Love love love these ideas! Thanks for sharing!